On this second day of competition at the Judo Grand Slam Tokyo 2016 in Japan, four categories were in action: Women’s -63kg and -70kg and men’s -73kg and -81kg. Once again the day proved that being an Olympic champion is no a guarantee of victory on the IJF World Judo Tour. Fabio BASILE (ITA) realised that yesterday after having been eliminated during his first round contest and today it was the turn of Tina TRSTENJAK (SLO) to suffer defeat in quarter final of the -63kg. The beauty of judo comes from the fact that nothing is written in advance and that all champions have to stay humble. 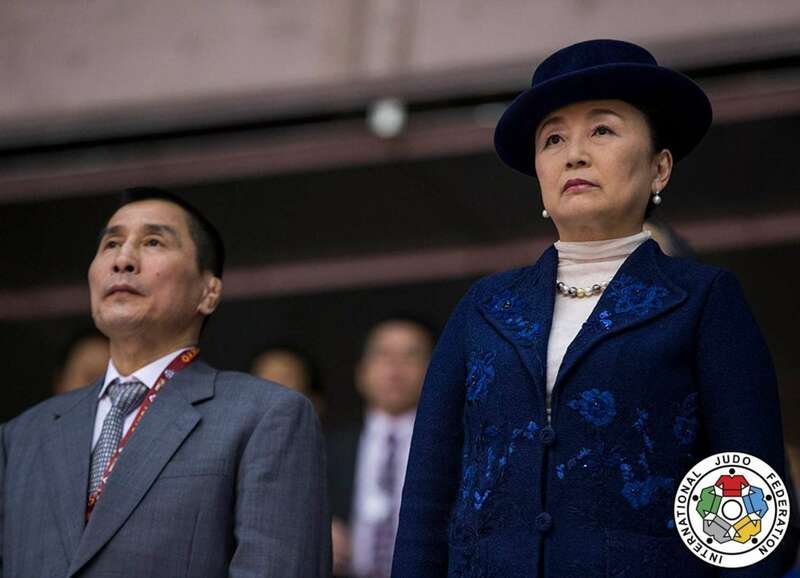 The quality of the judo displayed today at the Tokyo Metropolitan Gymnasium was outstanding for the full enjoyment of Her Imperial Highness Princess TOMOHITO of Mikasa. The President of the All Japan Judo Federation, Mr. Shoji MUNEOKA, was also present. The opening ceremony was held prior to the final block on day two as opening speeches were made following an introduction of the distinguished guests in attendance. 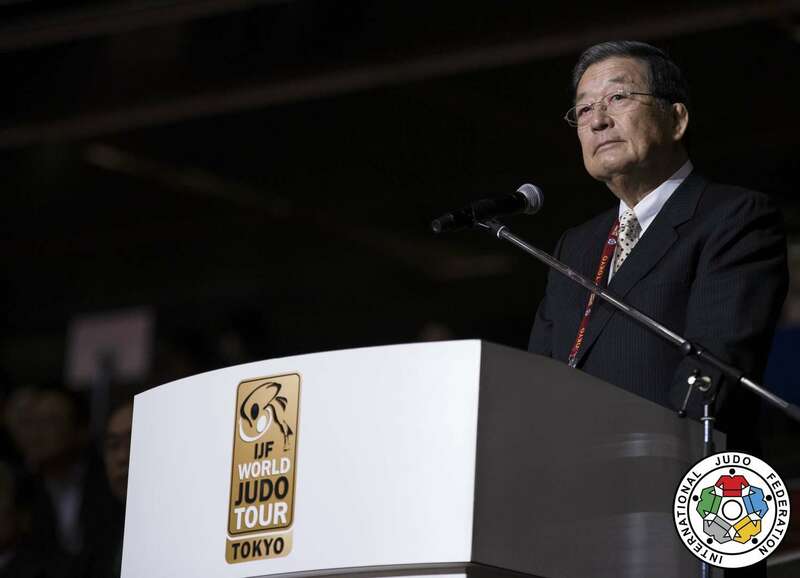 Mr. Shoji MUNEOKA, All Japan Judo Federation President, said: “Hello everyone, I am the President of AJJF, dear distinguished guests from IJF, the judo family from all over the world, it is a pleasure to welcome you here for the 2016 Tokyo Grand Slam at the Tokyo Metropolitan Gymnasium. “This prestigious tournament will feature the best judoka in the world including Rio 2016 Olympic champions and medallists. We will see many great contests here in what is already a special event once again this year. “Before judo became recognised as an Olympic sport, professor Jigoro Kano devoted himself to the principle of human education through one’s lifelong practice of judo. Confidence, etiquette and dignity are fundamental values of our sport. Our MIND (Manners, Independence, Nobility, Dignity) project has been promoted by our Federation as a way to develop judo’s global reach and visibility which is improving every year. “Victory over defeat is something we obtain from our training and control of the mind. Do not be arrogant in victory or discouraged in defeat, I wish you to represent all judo family members, show results of your daily efforts and inspire fans all over the world. 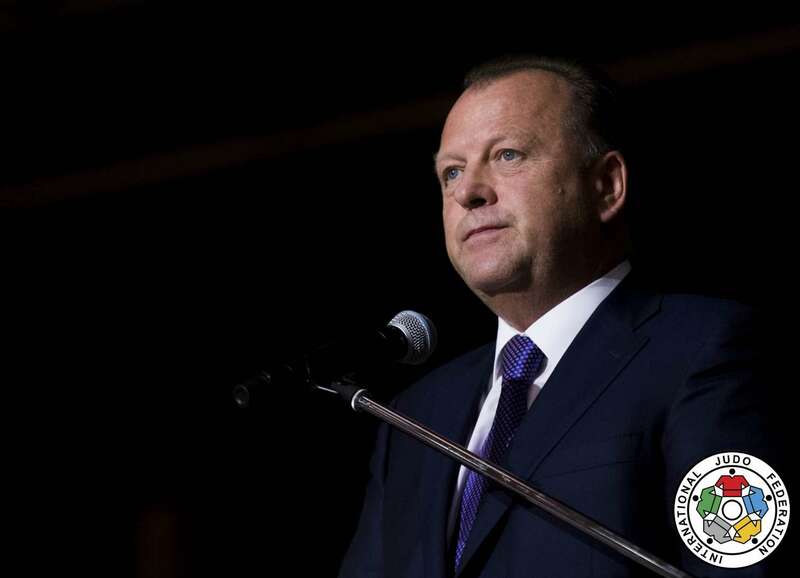 Mr. Marius VIZER, IJF President, said: “Your Imperial Highness Princess TOMOHITO, President MUNEOKA, guests, spectators, media, ladies and gentlemen, I want to congratulate the Japanese Judo team for achieving the best results at Rio 2016 Olympic Games. A ju no kata demonstration followed the welcoming speeches as tori TAKANO Megumi and her uke SHIRANO Hikaru demonstrated their specialty in front of a receptive audience of judo purists. Japan’s 13 medallists from day one of the Tokyo Grand Slam 2016 took part in an autograph session during the break as fans of all ages and from Japan and beyond had a chance to meet the starts of the Japanese team including Rio 2016 bronze medallists TAKATO Naohisa and KONDO Ami (JPN). The Tokyo Grand Slam 2016 concludes on Sunday with the heavyweights as the men’s -90kg, -100kg and +100kg categories bring the final event of the season to a high octane close. 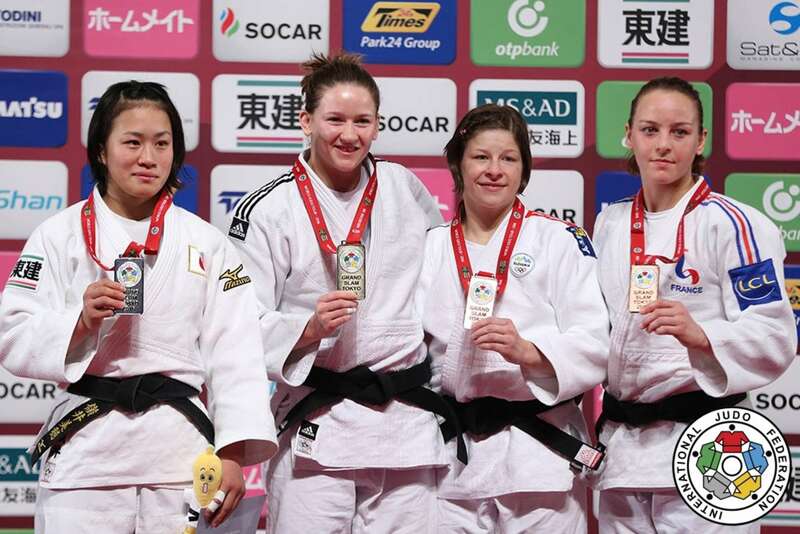 Abu Dhabi Grand Slam silver medallist Kathrin UNTERWURZACHER (AUT) won her second career Grand Slam gold medal as she defeated former Junior World Championships winner MINEI Miho (JPN) for -63kg gold. MINEI, who ruled the world as a junior in 2014, has had limited exposure to the IJF World Judo Tour while UNTERWURZACHER is a household name with Grand Prix, Grand Slam and World Judo Masters honours to her name. UNTERWURZACHER was almost countered from a sumi-gaeshi attack but quicly recovered and continued to attack until she broke the deadlock with a yuko from a ko-soto-gake. The Austrian was penalised for going out of the area but maintained her advantage with her tactical nous to record the biggest victory of her career. In the first semi-final MINEI, who shocked Rio 2016 Olympic champion Tina TRSTENJAK (SLO) by a yuko in their quarter-final, required added time to find a way past Almaty Grand Prix winner Margaux PINOT (FRA). MINEI and PINOT were even at the end of regular time with a single shido to their names and no scores distributed and moved into the unlimited period of golden score where the first score or penalty decides the winner. A reaching osoto-gari from the Japanese fighter sent her into the final with a yuko score. In the second semi-final Tashkent Grand Prix winner Daria DAVYDOVA (RUS) fell to UNTERWURZACHER. The Austrian submitted the Russian with a koshi-jime strangle having led by a waza-ari. The first bronze medal was won by Rio 2016 Olympic champion Tina TRSTENJAK (SLO) who bounced back from her unexpected quarter-final defeat to beat DAVYDOVA. The European, world and Olympic champion took the lead with a yuko from an ipon seoi-nage and added a second as she outscored her Russian opponent to take an important medal on her first outing as Slovenia’s -63kg Olympic kingpin. The second bronze medal was won by former Paris Grand Slam bronze medallist PINOT who defeated Tyumen Grand Slam winner NOUCHI Aimi (JPN) by a single shido in a scoreless contest. Frenchwoman PINOT, 22, entered the Grand Slam medal podium for the second stage in her career which is on the rise with every competition and she could be a prominent feature of the next IJF event, the 2017 Paris Grand Slam in February. Kodokan Cup gold medallist NIIZOE Saki (JPN) made a dream start to life on the IJF circuit as she beat her nearest rival in Tyumen Grand Slam winner ARAI Chizuru (JPN) to top the podium. The 20-year-old former Junior Asian Championships winner put ARAI under pressure from the outset and the latter was penalised with a shido for breaking the grip of her opponent with both hands. Both judoka were penalised with a shido for passivity as NIIZOE won a deserved gold with Rio 2016 Olympic champion at this weight TACHIMOTO Haruka among the interested parties in the considerable crowd. In the first semi-final ARAI held down former world number one Kelita ZUPANCIC (CAN) for osaekomi for 17 seconds and applied particular pressure to the left arm of the Canadian who conceded the contest. In the second semi-final Taipei Asian Open winner MAEDA Naeko (JPN) succumbed to NIIZOE on shido penalties with three against the former and one only against the 20-year-old. The first bronze medal was claimed by MAEDA who outlasted 2015 Tokyo Grand Slam silver medallist ONO Yoko (JPN) in golden score. ONO was penalised for passivity after two minutes of additional time to end the duelling chants from the companies behind their respective judoka. The second bronze medal was captured by two-time Grand Slam bronze medallist Elvismar RODRIGUEZ (VEN) who has spent the last couple of weeks training at Tokai University. RODRIGUEZ, who is still only 19, won an all-Pan American contest against ZUPANCIC with a must-see de-ashi-barai for ippon after 17 seconds of golden score. The Venezuelan spent several weeks at the IJF Training Centre in Budapest to prepare for Rio 2016 and was financially supported to compete at Olympic qualification events by the IJF. World Judo Masters winner HASHIMOTO Soichi (JPN) showed the enviable depth of the hosts as the absence of Olympic champion ONO Shohei did not change the destination of the -73kg gold medal. ONO has missed his home Grand Slam with a right ankle injury but two Japanese judoka still fought their way to the final to compete for the top place on the podium. HASHIMOTO showed that he is nobody’s deputy but rather a world-class fighter in his own right as he beat Grand Slam debutant DOI Takeshi (JPN) 0:2 on shido penalties for the victory and can look forward to a potential world title tilt in 2017. In the first semi-final 19-year-old TATSUKAWA Arata (JPN) was bested by HASHIMOTO by the smallest of margins as the contest was decided on shidos with two against the former and one against the top seed. In the second semi-final DOI upset Rio 2016 Olympic bronze medallist Dirk VAN TICHELT (BEL) by ippon with a stunning sode-tsurikomi-goshi with 90 seconds left on the clock. The first bronze medal contest saw two-time world bronze medallist VAN TICHELT slip to defeat against 23-year-old Tashkent Grand Prix silver medallist Giyosjon BOBOEV (UZB). The Uzbekistan fighter, who had a taste of Grand Slam silverware in Azerbaijan when he took silver in Baku, threw his Belgian opponent with uchi-mata sukashi for ippon with two minutes remaining. The second bronze medal went to TATSUKAWA in his first senior event as he surprised Abu Dhabi Grand Slam bronze medallist Musa MOGUSHKOV (RUS). The Japanese teen defeated one of the grittiest judoka in the category with a sumptuous sasae-tsurikomi-ashi after two minutes of golden score. Rio 2016 Olympic bronze medallist NAGASE Takanori (JPN) triumphed at the Tokyo Grand Slam for the third time in four years as he bested Glasgow European Open winner Dominic RESSEL (GER) in the -81kg final. NAGASE, 23, who could be identified as the reigning world champion by his red backpatch, rolled his German opponent over for a yuko score and moved straight into ne-waza where he finished the contest in osaekomi with a tate-shiho-gatame hold for 20 seconds. In the first semi-final NAGASE resisted the advances of Taipei Asian Open silver medallist HARUYAMA Yuki (JPN) to eke out a win over his countryman. Two shidos against HARUYAMA settled the scoreless contest after five minutes and the red backpatch of NAGASE was guaranteed to be on display in the final. In the second semi-final RESSEL ousted Zagreb Grand Prix bronze medallist Damian SZWARNOWIECKI (POL) with two scores as Europe had a rare finalist amid Asia and particularly Japan’s dominance. The first bronze medal was won by Tyumen Grand Slam winner Aslan LAPPINAGOV (RUS) who sealed a return to a Grand Slam medal podium by beating SZWARNOWIECKI. The 23-year-old Russian fighter submitted the Pole with shime-waza following a failed failed harai-makikomi by the latter who had to settle for fifth-place. The second bronze medal went to former Abu Dhabi Grand Slam winner Ivaylo IVANOV (BUL) who lived dangerously for all five minutes of regulation time but still found himself in the contest with HARUYAMA as both judoka had received a single shido. HARUYAMA had attacked with o-guruma, sode-tsurikomi-goshi and seoi-nage against the world number five IVANOV who weathered an onslaught before producing a moment of brilliance with a unique counter for a waza-ari after 32 seconds of golden score.